Steve Vai (guitar, Eventide H3000, keyboard, bass), David Rosenthal, Bob Harris (keyboard, background vocals), Pia Maiocco (keyboard), Nancy Fagen (vocals & hysteria), Stuart Hamm (bass), Chris Frazier, Tris Imboden (drums), Jamie Firlotte (boy vocals) David Coverdale, Rudy Sarzo, Adrian Vandenberg, Pascal Fillet, Laurel Fishman, Lillian Vai, Pam Vai, Joel Kaith, Corky Tanassy, Jamie Kornberg, Lauren Kornberg, Corinne Larue, Famin', Darla Albright, Laura Gross, Rupert Henry, Suzanna Harris, Julian Angel Vai (background vocals). Passion and Warfare established Steve Vai as a solo force to be reckoned with. 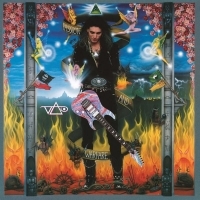 Recorded entirely in Vai’s Mothership home studio, Passion and Warfare represents Steve Vai as a melodic, heavy guitarist with a gift for remarkable composition and a deep desire to convey the mystical and the metaphysical through his every last note. Passion and Warfare was commercially successful. Boosted by the fan-favorite video for "The Audience is Listening", which received heavy rotation on MTV, the album peaked at N° 18 on the Billboard 200 no small feat for an instrumental guitar album. This crossover appeal set the stage for Vai's continued successes throughout his career. This 180 gram clear vinyl limited edition of Passion and Warfare, newly remastered from the original analog tapes, includes four newly discovered recordings from the album sessions : "Love Elixir", "We Are One", "As Above" and "So Below". Known for his intense, virtuosic and instantly recognizable guitar style, Vai a onetime student of artist Joe Satriani rose to prominence in 1980 when Frank Zappa invited the 20 year-old guitarist to join his touring band. He has since performed with a variety of acts from Alice Cooper and Ozzy Osbourne to Joe Jackson and heavy metal group Alcatrazz (where he replaced fellow virtuoso Yngwie Malmsteen). Vai remains one of the most honored guitarists of the past few decades. He’s won three Grammy Awards and garnered another eight nominations. In a Guitar World reader poll in 2012, Vai was voted the 10th greatest guitarist of all time. A seven string guitar designed by Vai for Ibanez has been utilized by progressive and metal bands including Korn and Dream Theater. Guitarists from Tom Morello of Rage Against The Machine to Mike Eizinger of Incubus have cited him as major influences on their playing.